Falling very much into the “does what it says on the tin” category, the K83 Wireless Entertainment Keyboard is a different outing to the usual gaming keyboard fare from Corsair. The company has been dabbling more and more in wireless peripherals of late, though, so the K83 isn’t wholly surprising, and it also still ties neatly into its iCUE software ecosystem. The living room aspirations of the K83 manifest themselves in various ways. A smart “lifestyle” look is achieved through the thinness and brushed aluminium top, and even the charging cable is flat and rubberised instead of round and braided. The WASD keys are a different tone of grey in an awkward homage to Corsair’s gaming roots, but there’s no RGB and no mechanical switches. Thankfully, thin doesn’t equal weak; the lightweight K83 is far more robust than its appearance suggests. The key layout is compact, so the arrow keys are compressed and there’s no numpad. Other functions from full-size keyboards like Ins, PrtSc, etc. are integrated as secondary functions of other keys, accessible via the FN key. Wireless connection is achieved over either 2.4GHz wireless or one of the two Bluetooth 4.2 LE channels, meaning you can have up to three devices paired at once and easily switch between them as necessary. The 2.4GHz wireless relies on a USB dongle but has the benefit of 1,000Hz polling (1ms response time) and 128-bit AES encryption. Over Bluetooth, you can expect a ~7.5ms response time. The range when using 2.4GHz is excellent – you’re more likely to stop being able to see what’s on screen before the keyboard loses range. F keys are frequently used to provide secondary functions, and here is no different. As well as handy shortcuts like Back, Browser, Alt+Tab, and Search, they allow you to switch between the three wireless channels and bring media controls to the table. What I particularly like is that these are actually primary functions; the FN key is needed to activate regular F-key functionality. To me this makes total sense, as the functions on offer are more likely to be used than normal ones. Corsair’s software lets you change this behaviour, so either way you’re fine. The response from the Corsair gaming scissor design switches (as Corsair calls them) is pleasant, crisp, and consistent across keys. The concave indent on keys serves them well, and spacing feels natural. The keyboard has a gentle angle built in as well as rubber feet on the underside, and whether you have a surface or just your lap to work with it’s comfortable to use. Keyboard control is just one side of the equation, however, as most devices will benefit from some cursor control. 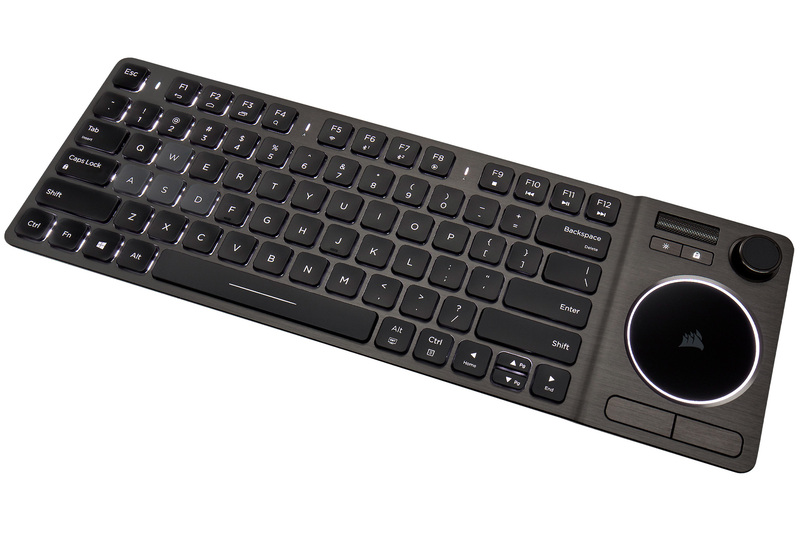 Enter the K83’s touchpad. With support for four-finger gestures in Windows 10, it’s well sized and sensibly positioned, and I like that the two dedicated clickers underneath also have a brushed aluminium finish. The circular design is inefficient, however, and trying to use four-finger gestures sees you running into the edges, so a more rectangular design is in order I feel. Above the pad you get a metal volume control wheel that Corsair has used successfully before, but this time it also has click-to-mute functionality. Beneath it you have a gaming mode/Windows lock key and a brightness control switch that will cycle between off, 33 percent, and 66 percent brightness. For 100 percent to be included in the cycle, you need to tick a box in the software. There’s even a joystick, which is designed to be used in conjunction with two bumper buttons, one with your index finger along the back edge, and one large one underneath that’s accessed with your middle finger. It’s a bit clunky to wield, but the idea is that it can be used for easy menu navigation, with the joystick offering quad-directional movements and the buttons taking on ‘select’ and ‘back’ functions. Alternatively, you can trigger the gaming mode with the Windows lock key, which turns the joystick into a more traditional analogue stick and the keys into right/left click. The idea this time is that casual games where time is not of the essence can also be played, with Corsair suggesting Minecraft, Hearthstone, and Civ VI as examples. With 20-key rollover, you’ll be fine doing this, but I'm not sold that anyone will want to wield the K83 in this way for very long, as it just feels a bit too awkward. Still, other similar devices have no such functions at all. The keys are backlit with white LEDs, and there’s no fancy per-key lighting or layered patterns, just three brightness levels. Sensibly, the keys auto-dim after 10s of no use (this can be changed), and the illuminated ring around the touchpad is a nice touch. The Windows lock and brightness control keys also illuminate, but I found the lighting here harder to make out; on the main keys it’s clear for both primary and secondary symbols. Caps and scroll lock indicator LEDs are found between the F keys, and here you also get a multi-purpose LED primarily for showing the wireless status. It will also show certain battery events, and you can press FN + Enter to get a visual indication of the current battery status. The micro-USB charging port is located on the back next to the power button. Corsair reckons the 2,070mAh Lithium-Ion battery is good for up to 40 hours of continuous use, but with light use (i.e. ~30 mins/day) it says one or two months is a better estimation. Backlight brightness level will be a big factor in battery life. The final feature worth mentioning is the ability to change the keyboard’s mode depending on the device it’s being used with, which would give you Dashboard control on macOS, for example, or specific Samsung TV commands like searching for channels.